Fans of watching movies in places other than theaters are in luck this weekend, as The A.V. Club has an opportunity for you to attend an early screening of the film Let’s Be Cops in a mobile 91-seat movie theatre located on Navy Pier. Known as a “CineTransformer,” this 53-foot double expandable trailer converts into a complete mobile cinema, providing a unique movie-going experience, plus it’s got the word “transformer” in the name. 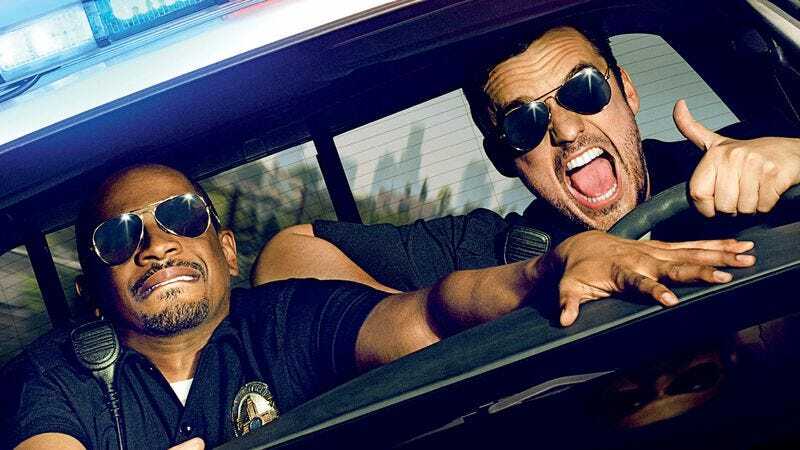 Let’s Be Cops follows Damon Wayans Jr. and Jake Johnson, who play down-on-their-luck friends who decide to dress as cops for Halloween. After successfully fooling their neighbors and becoming instant hits around town, they decide to continue the ruse and try their hand at real police work. Except for all the felonious activity, it sounds like a hoot! The film opens nationwide August 13, but we have a chance for you to attend an early screening July 19 at Navy Pier, here in Chicago. To win a pass simply follow the link here and fill out your information. Remember, seating in the mobile theater is first come, first serve; so arrive early! A synopsis and trailer for Let’s Be Cops can be found below.